U.S. Ambassador Susan Rice said Wednesday that her early account of the attack that killed the U.S. ambassador to Libya and three other Americans in Benghazi was based on the initial intelligence community assessments and was always subject to review and updates. Her comments attributing the attacks to a mob enraged over an anti-Muslim video posted on YouTube were widely denounced by Republicans during the U.S. presidential campaign. The attack came on the 11th anniversary of the Sept. 11, 2001 terror attacks on the United States, and her critics said it was clearly a terrorist attack aimed at the anniversary. The focus has fallen on Rice because she is a longtime White House insider and is believed to be President Barack Obama’s first choice to replace Secretary of State Hillary Clinton, who is not expected to stay on during his second term. Susan Rice’s talking points were scrubbed by James Clapper to fit to the Obama administration campaign theme that al Qaeda was dead. 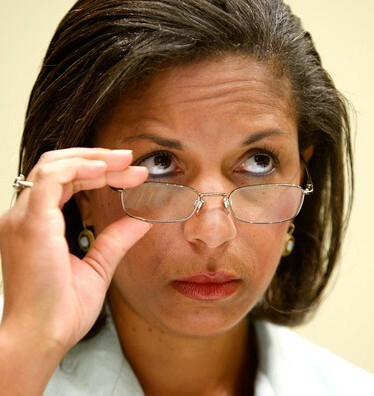 Apparently Rice was naive enough to accept what ever Clapper told her at face value. Yeah, I am sure that Rachel Maddow and Chrissy Mathews consider blonde to be a racist code word.